This week’s guests on the Empowering Ability Podcast are Sylvia Pauyrs, who has been providing personal supports for the last 20 years, and my sister Sarah who now receives personal support from Sylvia. For the last 6 months, Sylvia has been supporting Sarah to build a more independent lifestyle that enables and empowers Sarah. Since working with Sylvia, Sarah has experienced a tremendously positive shift, and finds herself joyfully trying new things and becoming more and more engaged in the community. 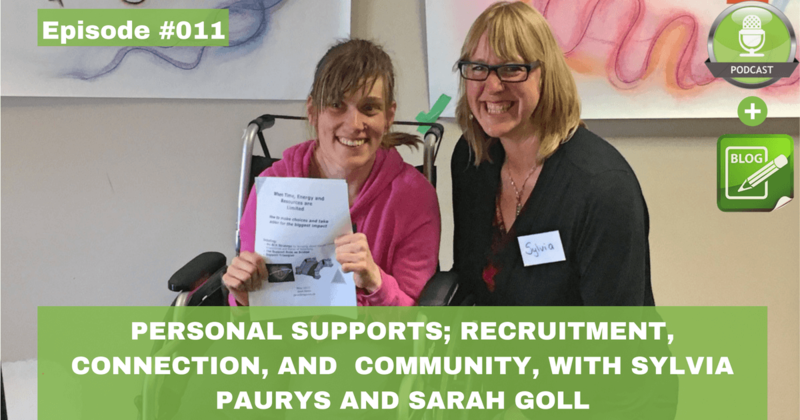 Sylvia and Sarah have been working diligently to create an independent and happy lifestyle for Sarah, and are here to share their experiences and insights on personal supports, connection and independent living. In this podcast, we cover 3 main support topics; recruitment, connection and community. Finding and retaining personal support is often one of the biggest challenges people face. So where do I go to find a personal support worker??! Local agencies often have support workers that they can provide to you on a fee-for-service basis, and depending on your eligibly these services may come at no cost. The agency will do a prescreening to make sure they person they are providing is adequately trained, has first aid, and a clean criminal record. The agency does a lot of the heavy lifting and can be a moderator when a conflict arises. The downside is that you have less of a say in who is provided to you, and the cost can be higher on a fee for service basis. RespiteServices.com is a government run service in Ontario and Nova Scotia, Canada that helps to recruit potential support workers that are available to people for hire. If you live elsewhere in the world, there may be a similar service you can use. The way that RespiteServices.com works is the family creates an online profile, and respiteservices.com then provides candidates to interview. (The process is similar on the service-provider side, they complete an online profile and wait for the phone to ring from someone interested in their services). RespiteServices.com also does a criminal record check and provides visibility on the service providers qualifications and experience. There is no cost to the family to use RespiteServices.com, but the family does the hiring. This can be a fair amount of work, but it provides the family more control over selecting their service providers, and often at a better hourly rate. The third way is to be resourceful and use your own network and job sites. Think of how an employer would hire a new employee, essentially this is what you are doing. Let family, friends, other support that you have now that you are looking to hire support. Often they will have connections that they can put you in touch with. You can also make job postings on online job boards, such as Indeed, Kijiji, local colleges, and Craigslist, or by putting an ad in the newspaper. When hiring support on your own you are responsible for the entire process including a criminal record check, and checking qualifications. Again, this can be a fair amount of work, but provides control of who you hire and often at a better hourly rate. * ** If you listen to the podcast, I share my most powerful interview question to use during the hiring process, to understand the interviewees intentions with the job, and to reveal their values. Sarah then jumps in on the podcast providing (what I think is) the most important insight in this episode – CONNECTION! Sarah shares that the connection she has with her support is the most important thing to her. Sarah’s strong connection with Sylvia has formed a deep level of trust that has allowed the pair to explore new interests and given Sarah the courage to step outside of her comfort zone. Sylvia shares that Sarah’s courage has in turn inspired her to step out of her comfort zone as well. Amazing! There are times when searching for personal support, that it can begin to feel stressful or even desperate, which is where connection can get lost. Connection is the key to success in a support partnership, so we should make personal connection the most important aspect when hiring. There are different types of support that an individual can request; it might be physical therapy, support with a routine, or getting out and involved in the community. For Sarah, getting out into the community and exploring her interests is a new type of support that she is investing in. The things that Sarah is doing in the community stems from her personal interests and Sylvia is supporting Sarah to make it happen. Sylvia says, “Some people want to be facilitated through a process of doing something new, some people get overwhelmed and need a bit more help.” Sylvia adapts to the individual and supports them as they request. Sylvia has taken the approach of holding Sarah capable and allowing her to be her own person, which has resulted in Sarah’s tremendous growth over the last 6 months. Sylvia shares a story of a stop at Sarah’s favorite place in the world, Starbucks. Sylvia noticed that the baristas were looking to Sylvia to take Sarah’s order. Recognizing this Sylvia would look away at her phone or in her purse and the baristas attention would be diverted to Sarah to take her order. As a result, Sarah places her own order and they are getting to know Sarah. Sarah will be known as a regular in no time. I would assume that Sylvia’s way of supporting Sarah, for example, to place her own order at Starbucks, has likely also had a lasting impact on some of the baristas and may inspire changes their behavior in their next interaction with someone in a wheel chair. Be sure to listen to the podcast for the full discussion. Thank you so much to Sylvia and Sarah for coming on the podcast to share their wisdom and experiences with personal support services. So grateful to you both for being so open and getting vulnerable with us by sharing your experiences.